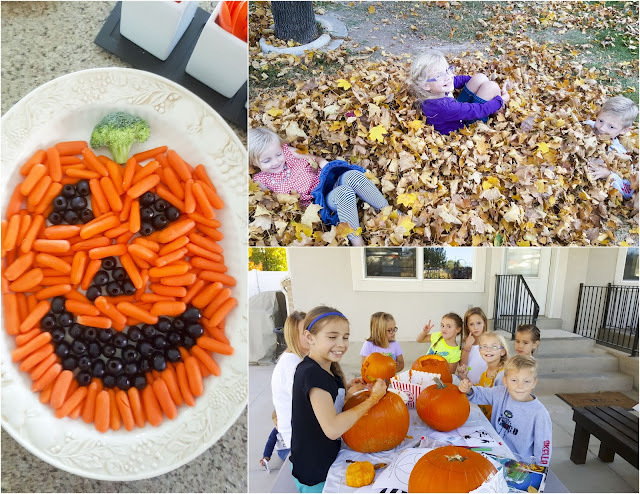 Over the past few years we've traditionally carved pumpkins with Todd's family. This year we all decided not to get together as a group but do them in our own homes. Carving pumpkins is not the most fun thing to do - especially cleaning out the guts - but everything is more fun with friends so we chose to host a friends get-together. We invited the Whitney's with their four girls, Sally and Claire Davis and the Cole's with their twin babies. 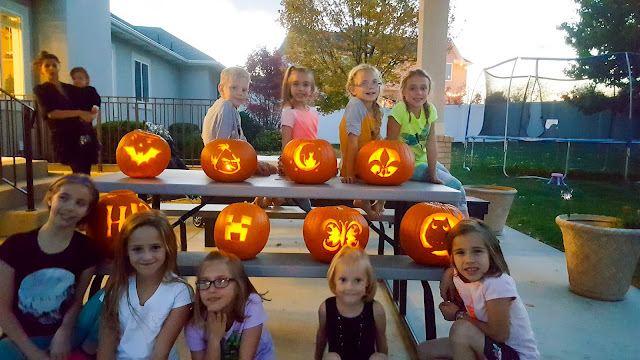 Two of the triplets who live across the street stopped by while we were carving so they helped too. The weather outside was fabulous so we set up two tables for everyone to use. We started at 4 pm. It took us an hour and a half to carve our pumpkins but they turned out great! Afterwards, everyone was starving so we cleaned up our mess and ate dinner while the kids filled up on rolls, and played in the yard. While the kids watched a movie in the theater the grown ups played Telestrations - by far my new favorite game. Once the movie was over and it was dark outside we visited our neighbor's Ghost Town. The Buehners were hosting their own Halloween party so he had everything turned on when we got there including the fog machine, singing pumpkins and his new toy a remote controlled old fashioned wheelchair.